A user control panel is shown on the chart that allows users to control the display of identified patterns. Users can turn on/off the desired patterns. All control panel parameters can be set by the users. Yancy Indicator Parameters - Control the overall functionality of the indicator. 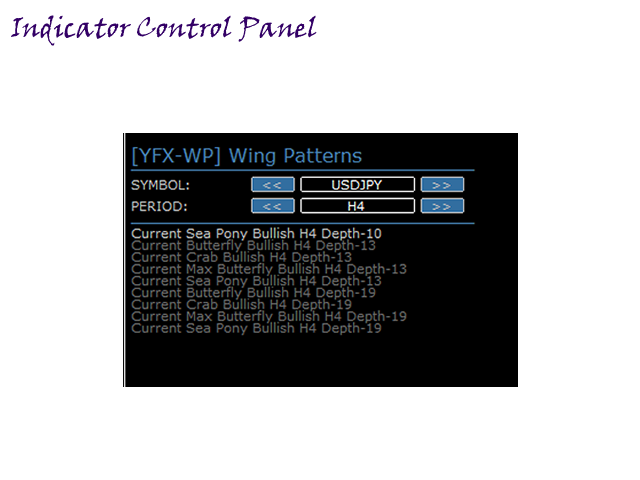 Wing Pattern Basic Parameters - Control how the indicator is calculated and used. Factor Parameters - Set global constant values used throughout the Wing Patterns indicator. Search Pattern Parameters - Control which patterns are analyzed and search during pattern analysis. 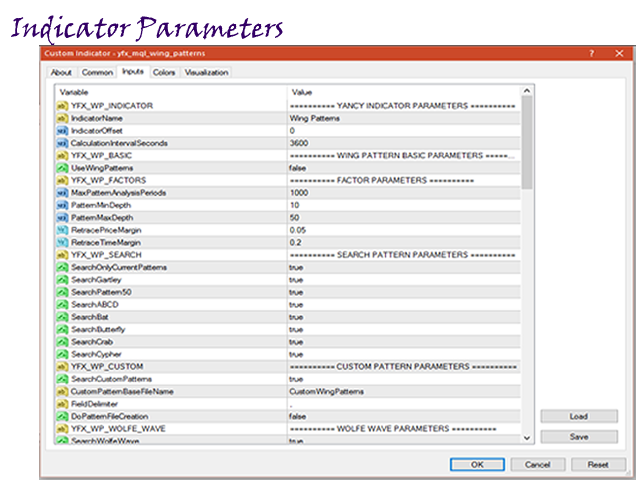 Custom Pattern Parameters - Control how user-defined patterns are treated. 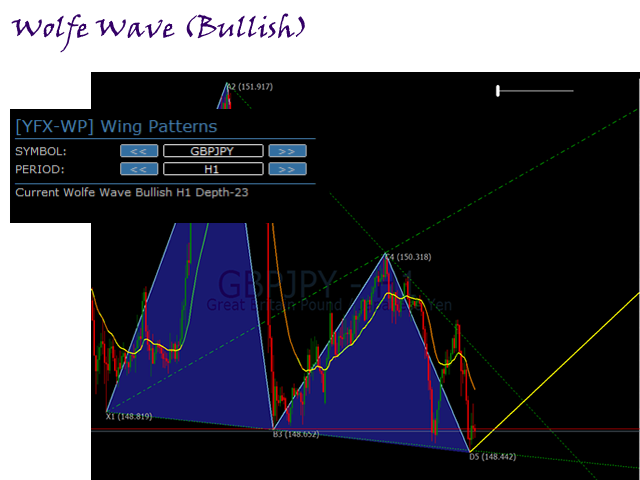 Wolfe Wave Parameters - Configure how the Wolfe Wave patterns are managed in the indicator. 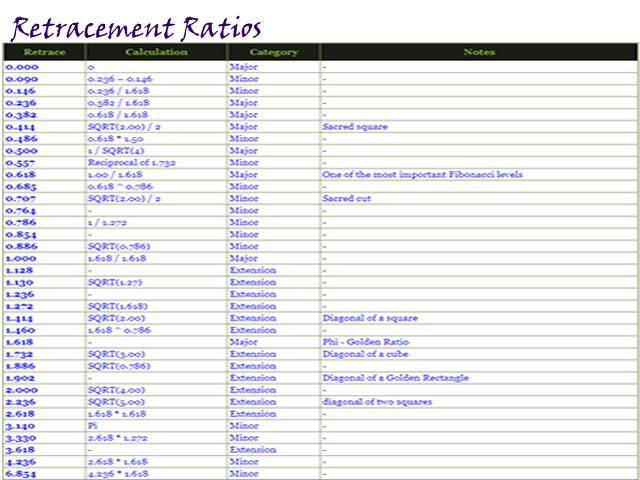 Fibonacci Parameters - Configure how Fibonacci retracements are managed. Size Parameters - Configure the size of lines used to draw patterns on the chart. Font Parameters - Manage the fonts used in the indicator. Color Parameters - Colors can be strongly preferred by users. The Wing Patterns indicator allows all colors to be changed according to each user’s preference. The specific colors do not change the underlying calculations of the indicator. Button Parameters - configure how control panel GUI objects are managed in the indicator. 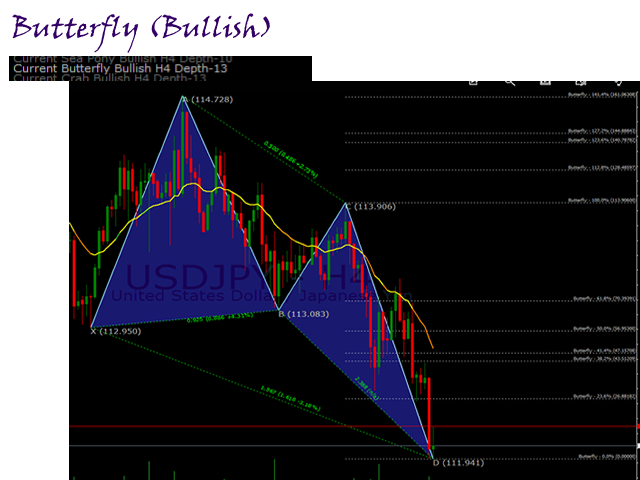 Display Parameters - Control how wing patterns are displayed on the chart. 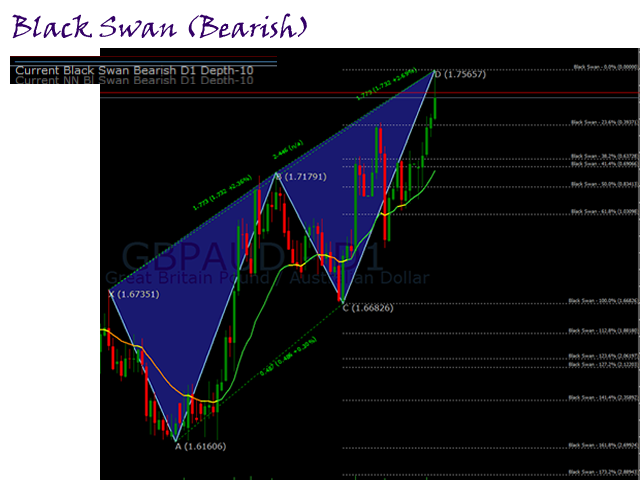 Signals Parameters - Manage how trade signals are treated by the indicator. Message Parameters - Determine how the indicator notifications are conveyed to the user. There are several options and the user can select which ones to use at any time. Multiple options can be enabled simultaneously. Quiet Time Parameters - Control when notification messages are conveyed to the user. Parameters in this section specify a time period when all notifications are disable. Settings in this section override the message parameters and alert parameters. No notification will be sent during quiet time. Message Info Parameters - Configure if internal statistics are maintained by the indicator. The information is generally not needed by the user. Thus, it is recommended to leave the options disabled. Debug Parameters - Debugging can be configured with the parameters in this section. Debugging would cause a great number of messages to be generated if enabled. It is highly recommended to leave debug disabled. * Major performance enhancements. Pattern calculation is reduced to only when needed. Parameter can be set to perform calculations on an interval or with every price tick. * Display panel enhancements. The display panel now keeps a rolling list of patterns found with newer patterns being added to top of list. 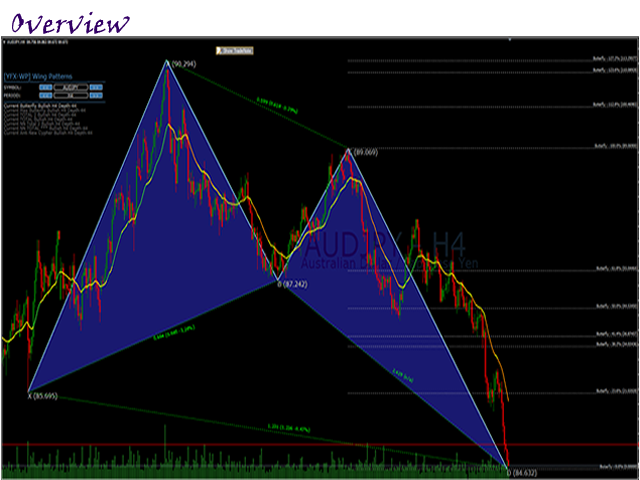 Fixed issue where the patterns were delayed in being drawn on chart. 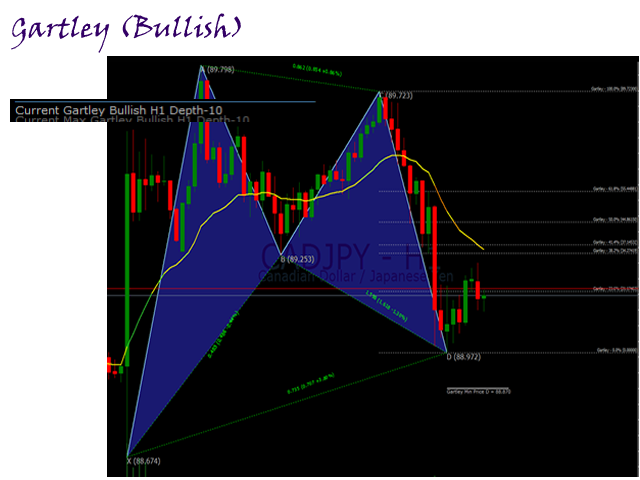 Now patterns are calculated and drawn immediately once indicator is placed on a chart, when patterns are found.